The Asus Zenfone Max(M1) is launched in India. In addition to the front f/2.2 selfie camera with LED flash1, the device features an advanced dual rear-camera system designed to take mobile photography to new heights. The 5.5-inch full-view HD+ (720 x 1440) display has an ultrawide 18:9 aspect ratio and ultrathin bezels that give the phone a high screen-to-body ratio. The hallmark of the smartphone is its huge battery capacity of 4000 mah, for maximum endurance. The smartphone also features face unlock, which gives very quick access to the users while unlocking. The Asus Zenfone is available in Black and Gold colors. It comes with a 5.5 inches HD+ display with a screen resolution of 1440*720 pixels and display type of IPS LCD (Corning Gorilla Glass). The display also features 83% screen to body ratio and a gorgeous 2.5D curved glass, featuring 18:9 aspect ratio. The handset is powered by the latest 64 bit quad core Qualcomm MSM8917, or 64 bit octa core Qualcomm MSM8937 processor. The device is coupled with Adreno 509 or Adreno 308 GPU, 3GB RAM and 32GB default storage. This storage can be expanded up to another 256GB. The front camera features 8MP / f/2.2 aperture, with main camera as 13MP / f/2.0 aperture with 0.03s PDAF. The Wide-view camera is equipped with 8MP / 120 degree wide-angle 6-element lens. The camera features include PixelMaster 4.0 camera modes including: auto mode with HDR / pro mode / beauty mode / super resolution / panorama / GIF animation / time lapse. The connectivity aspects include 802.11b/g/n dual-band wi-fi, wi-fi direct, DC-HSPA+ (DL/UL): 42/5.76Mbps, LTE-Cat 4 (2CA), bluetooth 4.0, Micro-USB and dual sim. It also feature GPS, A-GPS, GLONASS and BDS. It packs a high capacity 4000 mah battery, featuring twice lifespan feature with ASUS PowerMaster. The handset runs Android 8.0(Oreo) with Zen UI 5.0, out of the box. The rear fingerprint security sensor comes with five-finger, 360° recognition, unlocking in just 0.3 seconds. In addition, there is Face unlock for added convenience and security. The Asus price in India may start from Rs. 7,499 for 3GB and 32GB variant. Asus ZenFone Max M1, ZenFone Lite L1 first sale to go live at 12 PM on Flipkart. Asus ZenFone Max M1 will be available for Rs 7,499, and the ZenFone Lite L1 for Rs 5,999. 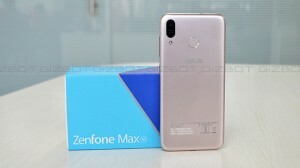 Asus rolls out FOTA update for ZenFone Max Pro M1. Asus has mentioned that the new FOTA update will be rolled out on a batch by batch basis. Flipkart Big Freedom sale: Exciting offers on Asus Zenfone Max Pro M1 and ZenFone 5Z. The Asus Zenfone Max Pro M1 will be available at a discount of Rs 500.